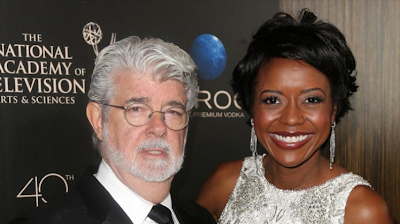 Newlyweds George Lucas and Mellody Hobson welcome daughter Everest via surrogate. "Star Wars" creator George Lucas and new wife Mellody Hobson have had a baby daughter. Representatives for the 69-year-old filmmaker announced the birth Monday. Everest Hobson Lucas was born Friday, the first child for Lucas and Hobson, who were married in June. The baby was born via surrogate. Hobson is Lucas' second wife. She is president of Ariel Investments and chairman of the board for DreamWorks Animation. Lucas also has a 32-year-old daughter, a 25-year-old daughter and a 20-year-old son. He was previously married to film editor Marcia Lou Griffin. At least they are honest of there baby girl I'm happy for them wishing a lot love for their family . Congrats and best wishes to them and their family. You are not my father. I have a father.